Seagate has tossed three SSDs into the CES arena, looking to please small NAS users, thin laptoppers and gamers. We have the IronWolf 100 NAS-focused SSD, the BarraCuda 510 thin laptop drive and the FireCuda 510 gaming device. The IronWolf 110 is a 2.5-inch drive with a slow 6Gbit/s SATA interface and five capacity levels: 240, 4780 and 960GB, and 1.92 and 3.84TB. It uses 3D TLC (3 bits/cell) flash and has a SandForce-derived controller with in-built compression (branded as DuraWrite). Seagate acquired this technology as part of its slurp of LSI from Avago in 2014. There is an existing line of IronWolf NAS hard drives and the IronWolf 110 can be a cache for these in suitably enabled arrays, such as the QNAP TVS-951X or used in an all-flash NAS system. It has NAS-optimised firmware and a NAS Health Management facility is coming. The performance looks good against disk drives but poor compared to NVMe-interface SSDs, with only up 90,000/55,000 random read/write IOPS and 560/535 MB/sec sequential read/write bandwidth. This is not much different from Seagate's Nytro 1351 and 1551 SSDs or its BarraCuda SSD (the BarraCuda 510 goes faster, though, as you'll see below). The average latency is 175/40μs read/write at the 3.84TB capacity level. The drives deliver up to 7,000TB-written (3.84TB model) or 1 drive write/day with a five-year warranty. Seagate said this SSD is targeted at prosumers, creative pros, small and medium businesses, as well as SME NAS users. It will be available later this month but there is no pricing information. The next two drives are basically one product branded two ways. It's a M.2 2280 SSD with from 256GB to 2TB in capacity, using Toshiba 64-layer 3D TLC NAND and an NVMe interface via a Phison E12 NVMe controller. The BarraCuda 510 is a single-sided version with 256GB and 512GB capacity levels aimed at thin laptop users and has encryption facilities. 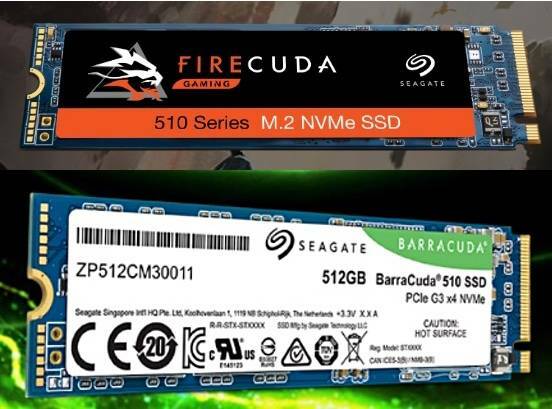 The FireCuda 510 is a double-sided variant with 1TB and 2TB capacity levels intended for gamers. There are no encryption facilities. The BarraCuda 510 is – oddly – skewed for random write operations with random read/write IOPS of up to 340,000/500,000. Usually the random read IOPS number is higher than the write IOPS figure. No reason is given for the write optimisation. It returns to read dominance with the sequential read/write bandwidth numbers: up to 3.4/2.1 GB/sec. Preliminary endurance numbers give it a 320 terabytes written (TBW) rating at the 512GB level and 160 TBW for the 256GB model. There is a five-year warranty and a 1.8 million hours mean time between failures (MTBF) rating. The FireCuda 510 has much higher performance – up to 620,000/600,000 random read/write IOPS and 3.45/3.2 GB/sec sequential read/write bandwidth. The endurance numbers are 2,600TBW for the 2TB product and 1,300TBW for the 1TB version – and the same 1.8 million hours MTBF and five-year warranty as for the BarraCuda 510. Both the BarraCuda 510 and FireCuda 510 have a two-year data recovery service option. They will be be shipping in March and no prices were announced.